The characteristics of our company and the products we make have made that our productions have found an important outlet in the private labels market Tissue, which is becoming an ever more the loyalty of consumers around the world. Cartiera San Giorgio supplies a range of tissue products regarding different market fields: from services to industry, from schools to hospitals, from Ho.Re.Ca to hotels and restaurants. In healthcare sector tissue products, such as disposable bed sheets, sleepers, even disposable gowns help to safeguard patients and attendants to save themselves from possible contamination. The use of tissue paper products is of fundamental importance in hospitals or in any healthcare facility, where obviously the potential risk of cross-contamination is higher. 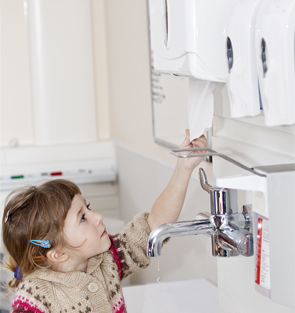 In many cases, however, the rules of healthcare structure and facilities even prohibit the use of any fabric devices to dry hands and for workspace environments cleaning activity..
Tissue paper products for community use such as rolls and paper towels, disposable towels, napkins for bars and restaurants, jumbo roll toilet paper, are ideal for the cleaning and hygiene of environments such as rooms, public toilets, kitchens, restaurants. Community Tissue paper products provide vital support to the cleaning of machinery and production equipment, safety and hygiene at the production site and for the protection of workers. In the area of ​​food preparation, including restaurants, supermarkets, food industries, where hygiene is vital to clean surfaces and to dry hands, tissue paper products are often the only solution really secure. AFH tissue products in the industrial sector are essential in many operations, from cleaning and maintenance of production equipment, to the safety and protection of employees as well. More generally, throughout the industrial production sector, wipers of paper also in coil, offer the level of cleanliness required by current quality standards, without the need for complex and often expensive washing operations. In the toilets of offices and public places, tissue paper towels not only are proving as more effective than warm air hand-dryers and fabric towels, but also provide an important contribution to prevent the spread of disease. School is the public place where students and staff are constantly exposed to bacteria and viruses and thus the tissue products for communities represent an ideal tool to ensure hygiene and cleanliness. Schools play a consistently important role in raising awareness in efforts to disseminate knowledge regarding the hygiene and the best way to protect against diseases.